Citation Information: J Clin Invest. 2016;126(8):2933-2940. https://doi.org/10.1172/JCI86957. Mean uterine artery PI versus gestational age in the general population (estimated 5th, 50th, and 95th percentiles are shown) and in the 11 patients with APS (11–21) who were treated with LMWH+LDA supplemented with pravastatin. 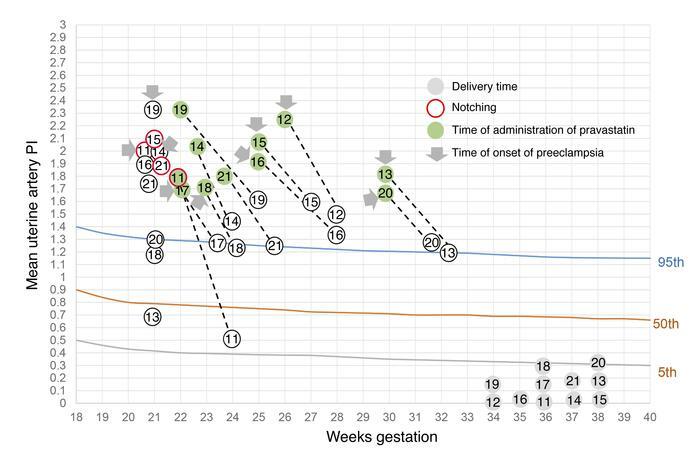 PI values in women with obstetric APS were over the 95th percentile. After pravastatin treatment (gray arrows), PI values decreased. Time of administration of pravastatin is indicated in green. Red circles indicate patients who presented notching in the uterine arteries.